149 miles. The White Rim trail is a popular ride to do over 3 or 4 days as a supported trip, camping out and taking time to explore the side canyons. The full loop is somewhere between 100 and 110 miles – depending on where you read – about 10 miles of paved road on the top of the plateau and the rest of it dirt road. A few people do the loop as a 1 day challenge, as my friend Peter Rosen and I did many years ago. We wanted to finish up the most difficult climb, so we parked at the top of the Shafer Trail and rode the loop counter-clockwise. 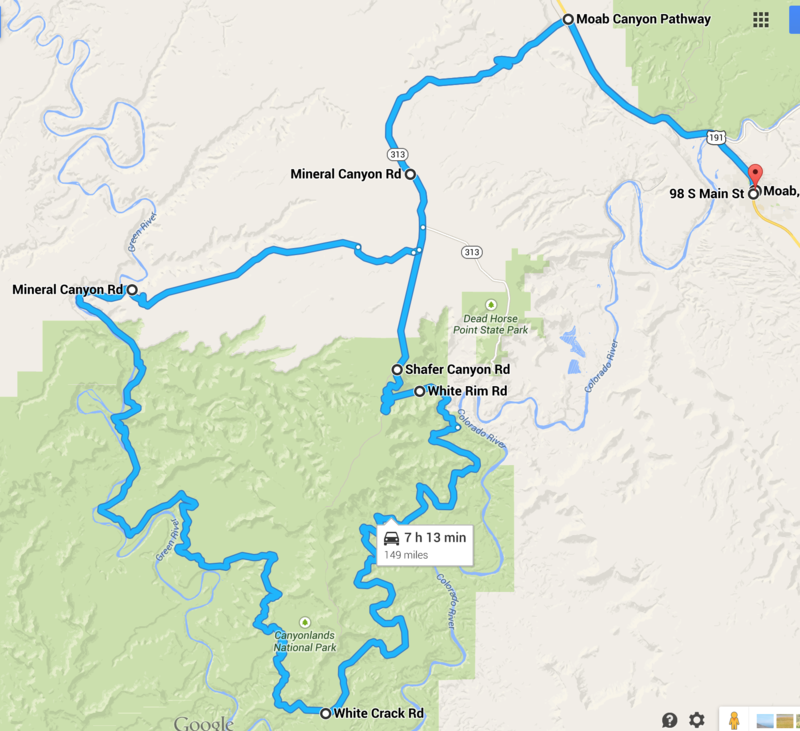 Since that time I’ve been intrigued about the idea of riding the loop in a day, starting in Moab. 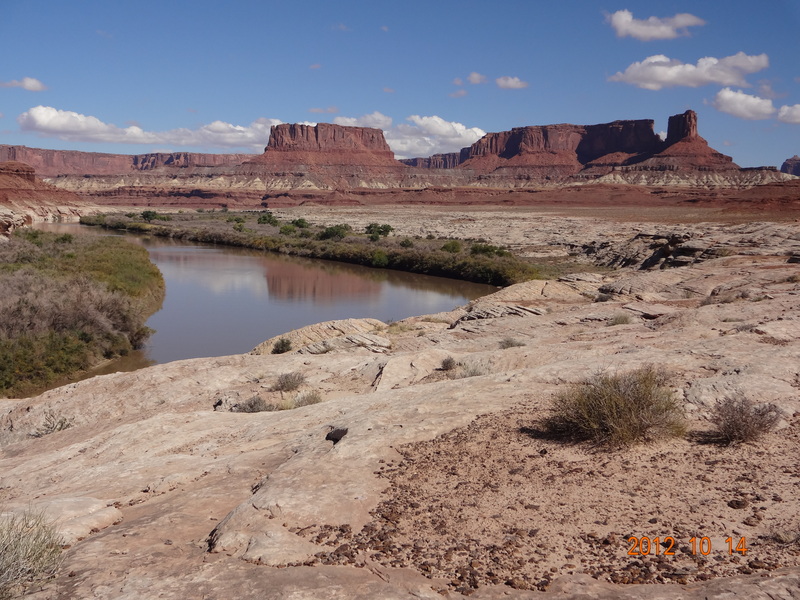 For many years I’ve gone with a group of friends to Moab twice a year to ride mountain bikes, but the October 2012 trip didn’t happen because too many people had other commitments. So I decided to go to Moab by myself and do the White Rim from Moab. I chose to ride it clockwise this time to experience it the other way. It seems that this is the most popular direction, perhaps because you don’t have to climb the Shafer Trail. I enjoyed it more clockwise because the most interesting and pretty country comes in the second half of the ride. I drove up to Island in the Sky and stashed 3 quarts of water and 2 quarts of Gatorade at the top of the Shafer Trail. The next day I left the Apache Motel at 3:30 a.m. carrying two quarts of water, and rode up Highway 191 for about 11 miles to the turnoff to Island in the Sky and Deadhorse Point. You turn left and follow Highway 313 for about 20 miles to the turnoff for the Shafer Trail, shortly before the Island in the Sky visitor center. From the Apache Motel to the turnoff for the Shafer Trail is 32 miles. The rest is simple – conceptually if not in practice. Go down the Shafer Trail and continue along the White Rim until you get to Mineral Bottom many hours later. You will pass many spectacular sights under a very big sky, and will also ride (or in my case, walk) up several short steep climbs in the second half of the ride. From Mineral Bottom ride up the lovely switchbacks, then continue for another 12 miles up the very gradual climb back to the paved road. Turn left and ride back to Moab. Rode October 14, 2012, in 14h 45m.